No matter you're a music fan or not, you must have saved several music videos downloaded from the internet, right? And here's the case, most video (especially from YouTube, Vimeo and other video sharing sites) online are in .flv format, which is not playable on popular media players including QuickTime, Windows Media Player or portable devices like iPhone, iPod, iPad, Zune etc. As a result, you have to convert FLV to other widely-supported format by your app or device. Take playing FLV music videos on iPod for example, since iPod supports particular file formats only like MP3, MOV, MP4, M4V, etc., then you can consider to convert FLV to MP3 or others. The conversion is not difficult, on contrast, it can be extremely easy if you have a good helper like professional Wondershare UniConverter (originally Wondershare Video Converter Ultimate). This article here would show you how to convert FLV to MP3 both on PC and Mac so that you can listen to the music on iPod or other MP3 players with ease. First of all, you can download the powerful Wondershare MP3 extractor via the download button below and follow the detailed step-by-step guide to extract MP3 from FLV video files. 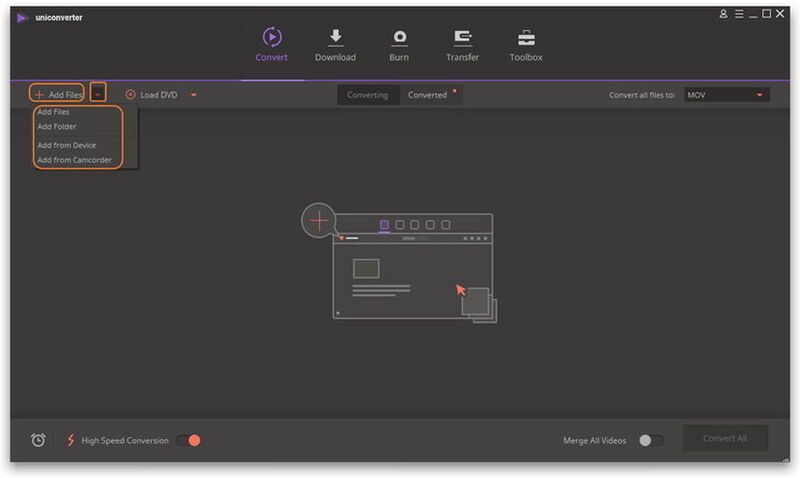 Step 1 Launch Wondershare UniConverter (originally Wondershare Video Converter Ultimate), then click Add Files button on the top of the main interface to load FLV video files or simply drag and drop them to the software. Step 2 Go to the Convert all files to: in the top-right of the program and click to expand output format, choose Audio > MP3 and select a quality in the right. section in the right, select MP3 under Format > Audio from the drop-down format list. Step 3 Click Convert button to initiate FLV to MP3 extraction. If you're Mac user, then download its corresponding Mac version below. Actually, FLV to MP3 conversion on Mac is similar to that on Windows except for a few differences on interface. 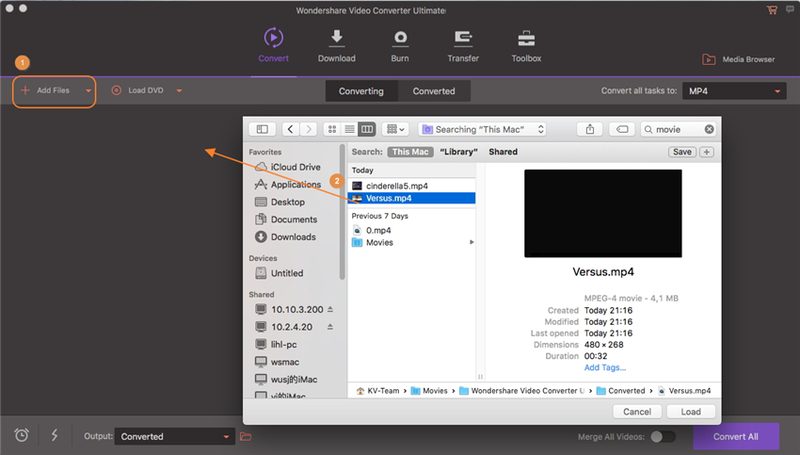 Step 1 Launch Wondershare UniConverter for Mac (originally Wondershare Video Converter Ultimate for Mac) after installation, then click Add Files to locate desired FLV videos to the program. Step 2 Click the down arrow icon from the Target section and choose MP3 from Audio catogry as the output format. Step 3 Click the Convert button in the bottom right to start converting FLV to MP3 on Mac. 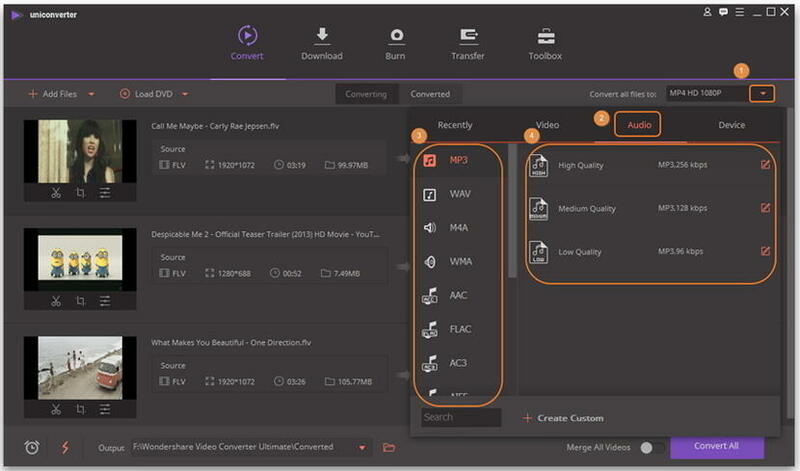 Note: Wondershare UniConverter (originally Wondershare Video Converter Ultimate) also supplies additional helpful functions for you to customize your FLV video files. To learn more details about their functions, you can refer to How to Edit Video.